FreshLook ONE-DAY Colour Contacts are just right for those times when you want a different story for the day, or only for a night. Because you take them out at the end of the day, you can start the next day with a fresh pair. Choose from four shades - Blue, Green, Pure Hazel, Gray. Its colour without commitment. 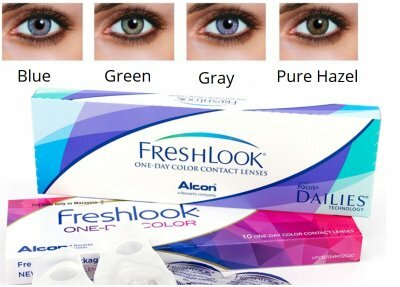 FreshLook One-Day color lenses do not require a new fitting for existing wearers of Focus Dailies lenses. You can use your same current Focus Dailies contact lens prescription for FreshLook One-Day color contacts!